I'm working on a new guide aplicable to latest versions of Wine (2.x or newer). Test reports, comments and votes for osu! would be very helpful. Consider that I don't pretend to be exhautive, because (hopefully) osu!lazer will come ~soon~. 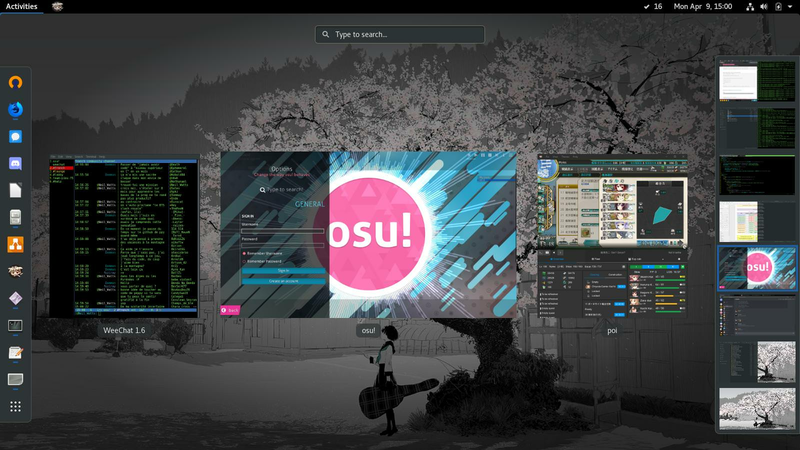 Instead, I put all minimum necessary steps to get osu! working and usefull tested workarounds for common problems. This way there's no need to strictly use a separate, managed Wine prefix if the default prefix is correctly configured. I can't connect ! It constantly tells me to verify myself online even though I made it already ! Help ! this helped, I guess It's a good idea to add these in PlayOnLinux section too... 18.2 had lib32-gnutls lib so that helped. 18.3 one doesn't... I wonder if there are any fallback ppas for these. Somewhat, I tried Invictus' way to do it on Wine 2.x. Tried first with native gdiplus.dll copied directly from Windows 10 and it crashes on my winecfg. Maybe I was too dumb to not change the system version in winecfg to Windows 10? Seems the latency for Wine 2.x is kinda far, but I haven't tried 1.8 again. You can infer that I hitted 'earlier'. Might as well as building myself 1.8. With GNOME 4(already in the works) being "Wayland-centric if not Wayland-only"(can't find the link but it was from an official source), LXQt and MATE already working on moving, and Cinnamon very likely to move with Mint's release based on Ubuntu 18.04, this paints a sad future for mainstream Linux distros. And considering consistently low latency anything on Wayland is unrealistic, at least right now, You might have to consider adding "Install XFCE or an X11 WM like i3 or Fluxbox" as a step in the future. Heck, last time I checked there was no Wacom(or any pentablet for that matter) suport in Wayland. Wayland is just another brick in the software wall made primarily to entrench RH's offerings as "the Linux standard". Even freaking "date" command is being replaced with "timedatectl" for no reason other than that. Is there actually a distro or repository where one can test wayland?